Bath melts are a product that never fully grab my attention. I mean I love having fun bright coloured bath bombs, or baths overflowing with bubbles, yet the idea of a bath melt never quite excites me the way I hope they will. With all this said, I couldn't resist trying this milk and honey bath melt I spotted in Boots when picking up some bath things. I wanted to try something new instead of the standard bath bomb and bubble baths to see how I got on with it and I couldn't wait to see an benefits it would have in the water. The bath melt comes in a little cardboard box to keep it safe and secure which is really nice and I like that it isn't over packaged. 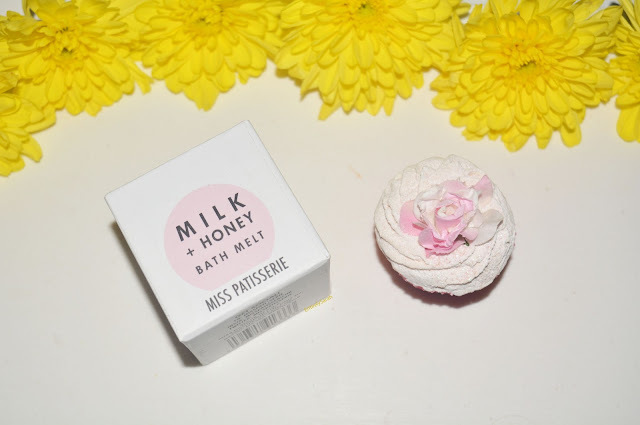 The bath melt comes in a little paper case that reminds me of a cupcake which is really cute. The top of the bath bomb has a really cute flower in the top. The flower in the top is a faux flower and so you need to remove the case and the flower before popping it in the bath. 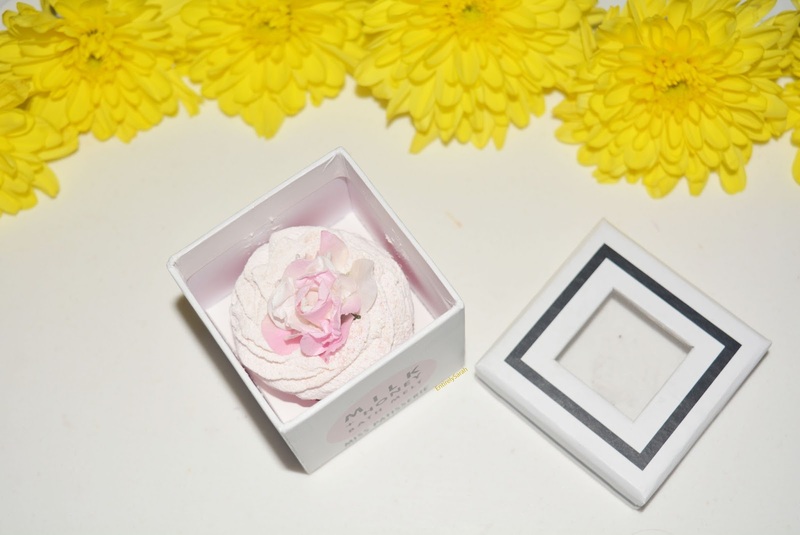 The bath melt is a really pretty light pink colour that looks like swirled icing or reminiscent of a cute cup cake which I find really satisfying to look at. This bath melt can either be used in one bath, or you can leave it to part melt in the bath and then take it out, let it dry off and use it in another bath. I decided, because I spent about 2 hours in the bath so I decided to just use it all and see what it did. I dropped it into the bath and I have to say it was very anticlimactic. I don't know what I expected as it isn't designed to fizz or do anything like that, but it just sank to the bottom and dissolved in the water slowly. This seemed to take ages to dissolve so I feel like if you have quick baths it may be something you can get 2 or 3 uses from. When in the bath it made the water feel soft and silky and very hydrating. This being said, I found that on the top of the water it felt a bit greasy, in such a way that I began to panic while laid there with my hair dunked under the water wondering if it was going to make my hair greasy, despite just freshly washing it. I can report back it did not make my hair greasy, however it did leave a gross oily scum line around the edge of the bath and it made me feel like I needed to immediately bleach the bath when I first got out. While I think this was nice to give a go, I definitely feel like this wasn't for me, I don't often opt for bath melts from any brand so they are always a bit of a gamble, and this wasn't horrible it just wasn't something I will go out and buy again. At £4.50 I feel like it is reasonably priced in the market and is one that definitely finds its place with other brands such as Lush. I think the beauty of this is that it is available in Boots, and so it means if you have a Boots store, but not a Lush in your home town you may be able to pick these up easier than some of the other brands you might want to try. I feel like I am just going to stay clear of the bath melts from any brand from now on, but I am really glad I gave this a go. If you do love bath melts I recommend giving this a chance as you may well enjoy it in a way I can't quite appreciate. You can shop this product here, and there is a range of scents to choose from if you want. Let me know your go to bath product of the moment as I love testing new things!